I am loving the change from long, hot, summer days to cool fall evenings. I’ve traded grilling hamburgers and hot dogs for simmering soups and stews. 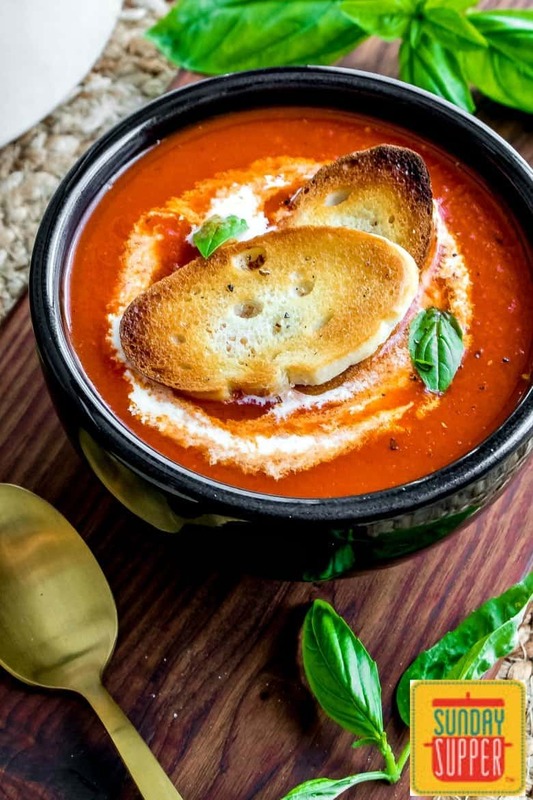 This simple, smoky Roasted Red Pepper Tomato Soup only uses a few simple ingredients so it is easy to make, and it is the perfect cold weather comfort food. On the weekends in the fall and winter you’ll find me in my kitchen cooking away. There is just something about cold weather and cooking comfort food that goes together. Don’t you agree? I’m a southern girl at heart so I love classic comfort food like Chicken Stew with Fluffy Dumplings. Anything I can make in my slow cooker like my Slow Cooker Pizza Soup is always a winner, and during the week when I don’t have time for a slow cooker I’ll pull out my pressure cooker and make my Pressure Cooker Taco Soup (in less then 30 minutes!). Lately though I’ve really been digging this super simple, totally delicious Roasted Red Pepper Tomato Soup. 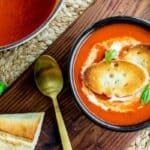 Roasted Red Pepper Tomato Soup is a lot like a traditional tomato soup, in fact, it starts with a tomato base. I keep it simple and use canned tomatoes I cook in a large saucepan with sautéed onions and garlic. To add a little extra punch of tomato flavor I also add a couple tablespoons of tomato paste. Then comes the most important part, roasted red peppers. If you’ve never had them, roasted red peppers are red bell peppers that have been roasted either over a fire or, if you’re making them yourself, in the oven under the broiler. The cooked skin peels away and you’re left with this smooth pepper that has a great smoky flavor. I rarely have the time to make my own roasted red peppers so I use jarred roasted red peppers. You can usually find them in the same aisle as the canned tomatoes. Once the roasted red peppers have been added, it’s time to pour in the broth (you can use chicken broth or vegetable broth) then you just simmer everything for about 30 minutes. When it has cooked for awhile and all of those flavors start to come together, take an immersion blender and carefully puree all of the ingredients until it is a smooth soup. Add a little salt to taste and you’re ready to eat! Garnish this soup with some toasted croutons and a little heavy cream or you can make a grilled cheese sandwich to go with it. 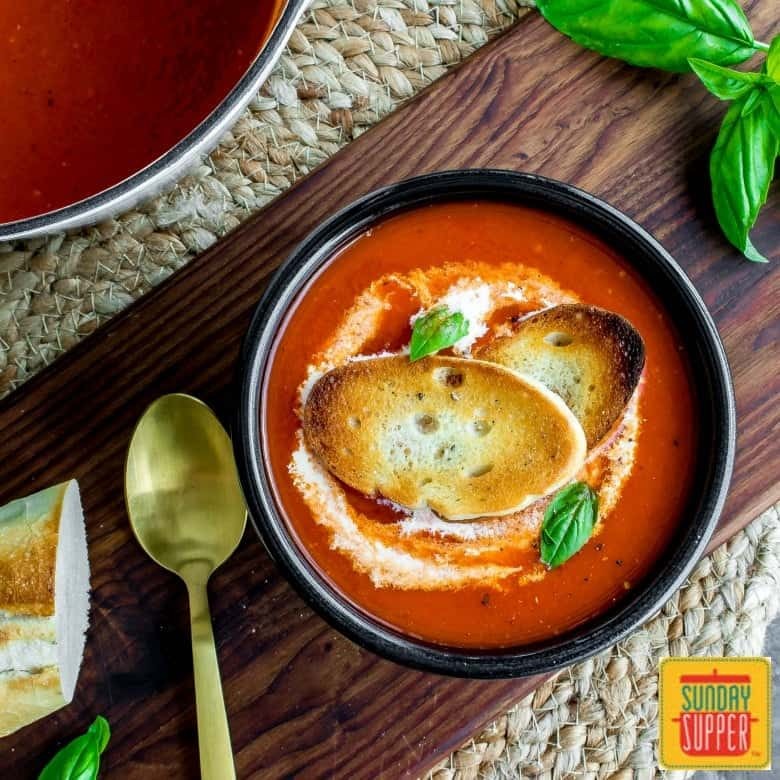 Either way this smooth, smokey, Roasted Red Pepper Tomato Soup is total cold weather comfort food! Get ready for fall with our simple comfort food recipe. 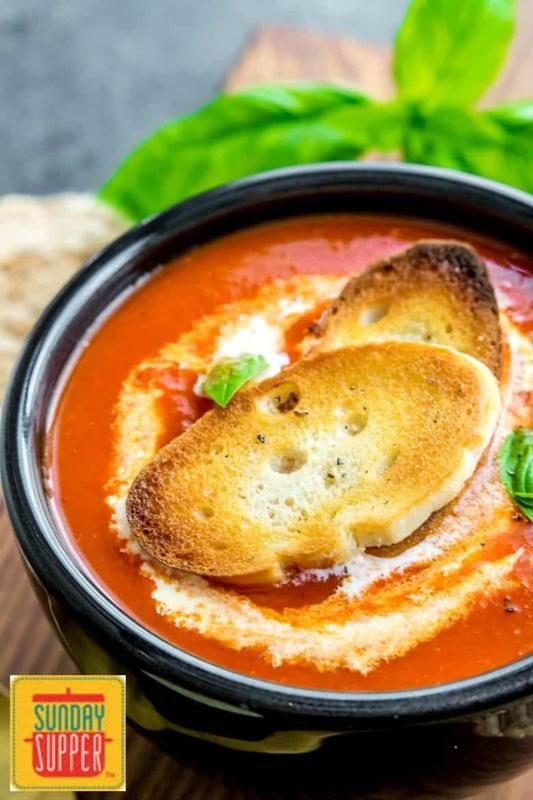 Make a big batch of this Roasted Red Pepper Tomato Soup tonight! If you're looking for an easy comfort food recipe this rich, smokey, Roasted Red Pepper is the ultimate cold weather comfort food. In a large pot over medium high heat saute onions until onions are tender. Add garlic and continue to cook for 2 minutes. Add the tomatoes, tomato paste, roasted red peppers, and broth. Bring to a boil and then reduce to a simmer and cover with a lid. Use an immersion blender to puree the soup ingredients until the soup is smooth. If you do not have an immersion blender you can carefully add the soup to a regular blender and puree it.